Five has reached an agreement with the BBC to ensure that it is available as widely as the other three major terrestrial broadcasters through the digital switchover. The channel was in danger of not being as widely available as it should have been as several regions' analogue TV signal was switched off, but has been granted a temporary place on the second BBC multiplex – at least until the channels are reordered for in 2009. 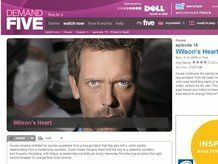 That reorganisation, which will coincide with the analogue signal being switched off in Granada, will accommodate the new HD services from ITV, Channel 4 and BBC – with Five's own HD service pencilled in for 2010. "The agreement ensures that Five will be received as widely as the other public service channels in the first parts of the country to undergo digital switchover: Border, West Country and Wales," reads the official statement. "A key feature of that reorganisation is for Five to continue to be available on a multiplex with the same reach as other public service channels, as switchover takes place. "As such, the arrangement with the BBC is a temporary one and is designed to facilitate digital switchover until that reorganisation takes place in late 2009."